Almost forgot, congradulations with 500 maps!!!! Hi i am back, and i would like to suggest more ideas for this game. So first you should add more game modes like area control or something that would be cool to play when you release the online version. Second you should add armour pick up so you can stay alive longer. I really need some guides to how to make maps I am having trouble making maps like this guy has!! so I just tried it and now it works I don't know what happened. 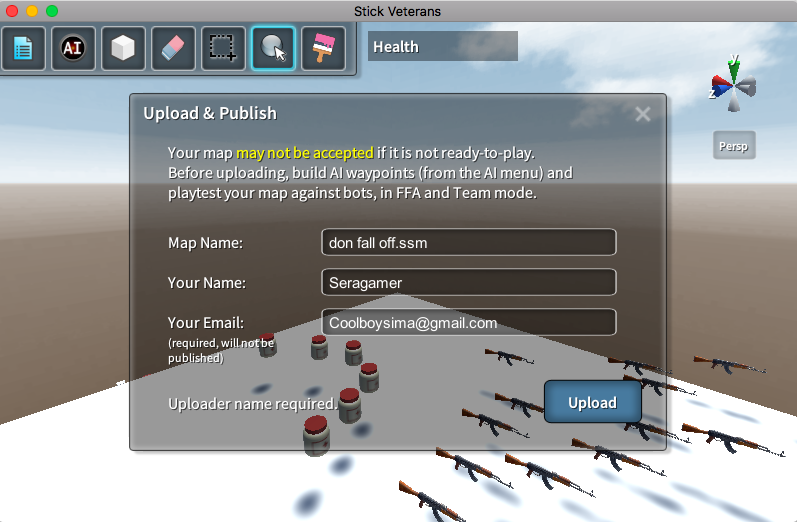 no i wanted to create a map and upload to public it says i need a uploader name even tho i filled in my email, name and map name can you please help me? I need some help that I can't upload my map to public it says put your name in even tho idid everything and filled I everything it still won't let me canyon please send a video on how to do that? Ok you might be right about this few things i kind of didn't think the payload mode through tho you are right needs big maps and lot's of understanding on how to make it. Weapon customization and character customization a good thing for a game like this.It will make your game look more colorful and alive. what about if you add vehicles and if a person makes a flat map of which you can fall off you may add a check box in the settings which will make invincible falls so you can't fall off. What about a juggernaut level in which team is against another team both teams have a juggernaut which has lot's of weapons, health,Armour but moves slowly and both teams have to defend their juggernaut.for the capture the flag can you make it the team that gets up to 5 flags wins and not by the most kills.Finally you might want to make the jet pack look better than a black box. These were my update ideas good luck and hope you make some great updates!!! so for next update can we have weapon customize ,skins,vehicles,payload game mode, actual mini gun. Is that possible? Because if you do that this game is going to go on a whole new level!!! I know i havent posted a comment here for a long time and i am a bit late for update sorry but well done mate!!! I knew you could do it man well done congrats with new update!!!! Ya you are right, anyway I am not going to hurry you take your time.I hope you succeed in making this a great multiplayer game. Add more game modes like:capture the flag,payload,control points.Will that be possible?Cause right now the game is kind of boring with only teams and free-for-all game modes, I would work on this before making multiplayer. you know what you can do you can like make a weapon mixer it's basically like, you take a weapon that is already their for example the sniper rifle and then combine it with an RPG and it will become a missile firing sniper rifle, wouldn't that be cool? Ok thanks for the help also can you make an update to the game so we can creat our own weapons that would be Fantastic.Thanks man Your awesome!!!!!!!!!!!!!!!!!! but also when I create my own map the bots won't move they just stay at spawn and only shoot, please fix this!!! Awesome game with lot's of maps!!!! !